John has been active in search and rescue since 1998. His experience includes serving as tech search person on IN-TF1 for two years, and serving on Monroe County SAR for several years. He is a past director and canine training officer for Argus K9 SAR, and currently is serving as a ground searcher/canine handler for Argus. John is also the current president of INSARA, and an executive board member of the Monroe County COAD. He has taken numerous courses in search and rescue, including ADSAR, FUNSAR, MLPI, AFRCC-5 day National Search and Rescue School’s inland SAR planning course, SAR200 (IDHS), Search Management (IDHS), ICS100, and NIMS 700. In addition, he maintains an amateur radio license. John has been an invited presenter at several search conferences, including the IN-KY SAR conference, and the annual IDHS conference. He is a recipient of the President’s Volunteer Service Award. As a canine handler, he and his previous area wilderness dog were search active for Argus and participated in many searches, trainings and demonstrations. He is currently training his new dog, Yeager. He is a certified instructor for NASAR’s Fundamentals of Search and Rescue, and Managing a Lost Person Incident courses. John has been active in civil search and rescue since 2011. He is a NASAR certified instructor for Introduction to SAR, Fundamentals of SAR, Managing Lost Person Incidents, and is a regular preventive (kids) SAR instructor in the NASAR “hug-a-tree” program. John is also a Red Cross instructor for First Aid/CPR/AED. John’s background includes service in the US Marine Corps, Army National Guard and the Indiana Guard Reserve, where he is currently the executive officer of the Search and Rescue Training Team. John works fulltime as an emergency management professional at Indiana University. In addition to emergency response and preparedness duties, he also researches and presents on best practices with missing college students. He regularly consults with other institutions on policy, practice, and response to missing students and has developed a nationally recognized best practice model. John is also a member of the Indiana Department of Homeland Security Incident Management Assistance Team and a member of Team Rubicon. A.J. has been active in Search and Rescue since 2010. He is the current director of Argus K9 Search and Rescue (http://www.argusk9.org) as well as the RACES officer for Monroe County. A.J. has complete FUNSAR, SARTECH II and MPLI certifications. He is also training Sasha a hound mix as an Area dog. He is also the web-master for INSARA, and a member of the INSARA board. AJ is a certified instructor for NASAR's Managing a Lost Person Incident course, as well as Introduction to Communications, and Drone operations for SAR. Tom Millen has been a voting member of the National Association for Search and Rescue (NASAR) since 1983. He is a NASAR Introduction to Search and Rescue (ISAR), Fundamental of Search and Rescue (FUNSAR), Advanced Search and Rescue (ADSAR), Managing the Lost Person Incident (MLPI) and Plans Section Chief – Search and Rescue (PSC-SAR) Instructor for NASAR. He was certified SAR TECH II in North Carolina in 1992 and was certified SAR TECH I/Crew Leader III in Colorado in 1996. He has been the Lead Instructor for the NASAR FUNSAR course at Indiana University since 1993. Tom served on the NASAR Board of Directors from 1993 to 1999. He was the NASAR Vice President for Education from 1996 to 1998. Tom also served as the Program Director of ISAR and FUNSAR and well as the former NASAR Search and Rescue Medical Responder (SARMR) Program. He co-authored the NASAR ADSAR textbook and has given several presentations at both national and state SAR conferences. Tom was awarded the first-ever NASAR Instructor of the Year Award in 1995 and was later awarded it again in 2012. Tom is now a Life Member of NASAR and he continues to support the association.Tom has been a charter member of the Indiana Search and Rescue Association (INSARA) since 1995 where he has served in several leadership positions. He continues to support the objectives of INSARA to provide NASAR training to its member organizations. Tom was a committee member of the Indiana Department of Homeland Security’s (IDHS) Search and Rescue Training Advisory Committee (SARTAC). He was appointed as the Chairman of the subcommittee that developed three Ground SAR courses for IDHS: Ground SAR Awareness, Ground SAR Operations and Ground SAR Technician. He was then asked to Chair the development of IDHS’s Search Management Awareness course. Tom was lead instructor of all initial IDHS Ground SAR and Search Management courses starting in 2005. Tom began his ‘SAR career’ in 1975 as a cadet in the Civil Air Patrol (CAP) where he later earned his Mitchel Award as a cadet officer and became a pilot. He later achieved the rank of Senior Member Captain and was a squadron commander. He eventually left CAP in 1985 for other pursuits. He was later recruited back into the CAP to serve as a pilot in 2013. Tom has also volunteered in the past as an adult leader in the Explorer (Boy Scouts of America) SAR (ESAR) program from the late 1980’s to the early 1990’s. Tom had served with the Benton County SAR (BCSAR) team in northwest Arkansas while an undergraduate engineering student where he was an active member from 1988 to 1991. Tom acquired his initial NASAR training (FUNSAR and MLPI) while a member of BCSAR. Tom was also an active member of the Monroe County SAR (MCSAR) in Indiana from 1994 to 2004. He was a reserve member of the Hendricks County EMA SAR (HCEMASAR) team until 2008. Tom joined the Indiana Guard Reserve (IGR) in 2009. He currently holds the rank of Captain and is the Officer-in-Charge (OIC) of the IGR’s SAR Training Team (SAR-TT) under the IGR’s Training Academy that is stationed at Camp Atterbury Joint Maneuvering Training Center (CAJMTC). Captain Millen continues to work with the SAR Training Team to develop new SAR programs for the IGR as well as provide training to IGR soldiers. Captain Millen continues to serve with the IGR Training Academy and its SAR Training Team. Tom earned his Associate of Applied Science in Electronics Communications from Indiana Vocational Technical College (IVTC) in 1981, Bachelor of Science in Electrical Engineering from the University of Arkansas in 1991, Technical Certificate in Practical Nursing from IVTC in 1994, and his Master of Science in Space Studies, Aerospace Science concentration, from the American Military University in 2015. Tom presented his thesis on laser-induced plasma rocket propulsion at the 2015 International Electric Propulsion Conference (IEPC) in Kobe, Japan in July 2015. Tom was both an adjunct and fulltime professor of electronics and lasers for Ivy Tech Community College for over ten years. He is now a civilian electrical engineer for the U.S. Navy at NSWC Crane. He had worked in airborne electronic warfare and is now a member of the maritime electro-optics team. Besides his regular engineering duties, Tom also travels both domestically and internationally to train U.S. Navy sailors in Electro-Optics/Infrared (EO/IR) as an instructor for maritime EO. Jan Harkner-Abbs brings more than 40 years of dog training and an additional 23 years of work in emergency and K9 services to ISART. She has assisted on National disaster and missing person cases here and around the country. Harkner-Abbs is a 19 year member of the Orange Township Volunteer Fire Department, an Advanced EMT, rescue diver, Indiana State Fire instructor 3 and NASAR instructor. Jan owns and operates her own 40 acre K9 training facility. Professionally, she has been in the field of education for 33 years and is a consultant for special needs children. Her passion for helping others and working with dogs is passed on to each member of the team, many of whom have trained and worked alongside her for decades. Employed for over 23 years (before early retirement) as an engineer in the powertrain dept. for the Navistar Corp. in Ft. Wayne IN, Karen also assisted as a company medic, fire brigade & HAZMAT team member. In her volunteer professions Karen serves her community with the Saint Joseph Fire Department Inc. as an EMT-A, Indiana Department of Homeland Security (IDHS)/National Association of Search and Rescue (NASAR Tech II) Search and Rescue (SAR) Technician and K9 handler, as well being a member of the Northeast Indiana American Red Cross Disaster Services Human Resources Team and ERIN’s House Grief Facilitator. 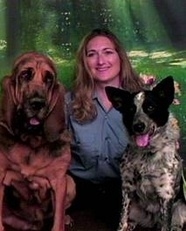 Karen has been a K9 handler for over 15 years working mantrailing bloodhounds & a HRD Australian cattle dog and is a member of Indiana Search and Response Team, Inc. Since 1998 they have been deployed in the surrounding MI/IN/OH areas assisting FBI, DNR, state/city police, sheriff & fire dept/dive teams on missing person rescue & recovery incidents. Karen also uses her SAR K9s promoting public safety & prevention education through the fire department’s BE SAFE (Burn Education Safety Awareness for Everyone) & Hug-A-Tree programs where she and the K9s demonstrate safety awareness & prevention practices.